SOMETHING IS WRONG HERE. 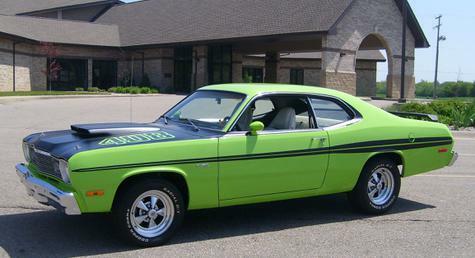 THE LAST DUSTER IN THAT BODY STYLE WAS 1973, THEN THEY CHANGED TO A WHOLE NEW MODEL IN 74. (CANT THINK OF WHAT THE NAME WAS). THE CAR IN THE PHOTO LOOKS LIKE MAYBE A 73, NEED TO SEE THE TAIL LIGHTS. Definitely eye popping color, with the white interior, that's the car to have here in Arizona. Just one photo doesn't cut it ........need more pics, interior, engine bay, come on, share the eye candy.